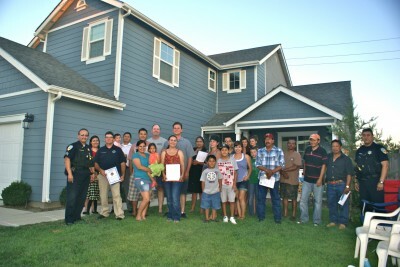 More than 20 members of the Walton Avenue neighborhood block gathered together on a recent Sunday evening to meet with Sanger Police Department officers to organize a Community Watch Group (CWG). Walton Avenue neighbors gather in front of the home of Andrew and Randra Ratzlaff for a Sanger Community Watch meeting with Sanger Police Department officers. “I think this was awesome. It’s actually, I guess you could say, overdue,” said Walton Avenue resident David Lucero about starting a CWG on his block. Andrew and Randra Ratzlaff invited all 22 neighboring households that live along Walton Avenue to attend the SCWP meeting, in hopes of organizing a CWG. According to Ratzlaff, more than half of her neighbors attended. Ratzlaff said she knew most of her neighbors before the SCWP meeting. 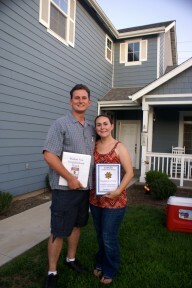 Sanger Community Watch Program Walton Avenue Block Captains Andrew and Randra Ratzlaff, in front of their home, with their program information binder and packet. L to r- Andrew Ratzlaff and Randra Ratzlaff. Randra, along with her husband, Andrew, will be CWG Walton Avenue Block Captains. According to Sanger Police Department Community Service Officer Paul Welch, the ultimate goal of the SCWP is to have established watch groups all over the City of Sanger. “The benefit is not just to lower crime but have a higher quality of life in our neighborhoods,” said Welch. Interest in forming CWG is spreading and not limited to any particular part of town. Sanger Police Department Officer Tom Reinhart spoke to the Walton neighbors, along with Officer Henry Diaz who addressed the Spanish speaking Walton residents. Reinhart also invited the newly formed CWG to attend the upcoming National Night Out. 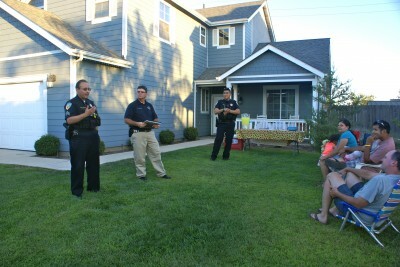 Sanger Police Department officers answer questions from Walton Avenue neighbors. L to R - Sergeant Greg Velasquez, Officer Tom Reinhart and Officer Henry Diaz. During the SCWP meeting, Reinhart and Diaz provided information on the May 2012 crime report and guided the Walton Avenue CWG through the information in the SCWP packet. Reinhart stressed the importance of filling out the Phone Tree and sharing it with all the neighbors. Reinhart also went over door locks and the point of entry for most break-ins. Reinhart also emphasized the importance of having a functional smoke alarm and carbon monoxide detector. Safety is a top priority and being observant of your surroundings is important in a CWG. How a CWG member handles a situation can differ depending on whether it is daytime or nighttime. The Sanger Police Department put together handouts, flyers, and even designed signage that reflects more pride in the Sanger community than the generic national programs provided and is more user friendly, according to Welch. That material is what is included in the SCWP informational packet. Walton Avenue neighbors take turns filling in their contact information on the neighborhood phone tree form, from the Sanger Community Watch Program packet, that will be shared, once completed, with the neighborhood. L to R- David Lucero and Randra Ratzlaff. Reinhart stated that it is not difficult to set up a SCWP meeting. “It’s really easy to do. It was one phone call to the Sanger Police Department, to Jaimy Gaines, and she sent me everything out,” said Randra, who then invited her neighbors to a SCWP meeting at her home and offered light refreshments. “Like Randi said, it’s very important for the neighborhood to get together,” added Lucero, “especially we’re one block, but if we can get it, like the officer said to the other blocks behind us, it will actually make our homes and our block very safe, in this area,”.